Sanctuary Ananda is a 42-passenger ship launched in late 2014 by luxury tour and boutique cruise operator Sanctuary Retreats. 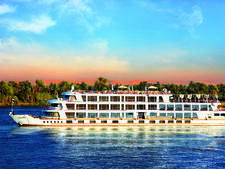 The ship sails on eight itineraries, ranging from three-night discovery cruises between Bagan and Mandalay to 11-night exploration cruises along the Irrawaddy and Chindwin rivers. A standout feature is designated accommodation for private guides upon request with the hospitality and service staff, for guests who want to bring their own personal tour guides onboard. Sanctuary Ananda's 21 cabins, located on three decks, include four Luxury staterooms that each measure 334 to 356 square feet and a signature Owner's Suite at an expansive 807 square feet (this top cabin also offers butler service). Other cabins range from 291 to 301 square feet, and all staterooms have balconies with room to sit outside. Cabins have vintage photography on the walls. All classes of cabins are decorated with local fabrics, wood and lacquerware, and they include air-conditioning and personal electronic safety deposit boxes. The smaller suites each have double or twin beds and a bathroom with a monsoon shower, while the four Luxury suites have additional indoor seating areas and third convertible beds for children. Two pairs of interconnecting cabins are also available for families. The Owner's suite has a king-sized bed, dressing area, separate living and dining areas, a freestanding bathtub and a monsoon shower. Meals are served in the main dining room, Talifoo Restaurant, and alfresco lunch is available in the Mindoon Restaurant. The onboard library can also be used for private dining. The upper Bhamo Deck, where all the Luxury Suites are situated, houses the Kansi panorama lounge and, forward, a sun deck and plunge pool. Other facilities on the vessel include the Thambayadine Spa by L'Occitane, where local treatments and massages are available, in partnership with L'Occitane. There are also lectures as well as traditional clothing and make-up demonstrations; they're complimentary. Sanctuary Retreats include meals, soft drinks, local beer, imported wines during mealtimes and guided sightseeing within the cost of the cruise. International and domestic flights are not included. Cruises start or finish in Bagan, Mandalay or Yangon, all of which are accessible by air. 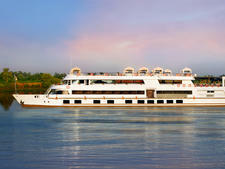 Launched in 1993 and refurbished in 2009, Sun Boat III is a river yacht with four decks that carries up to 36 passengers. 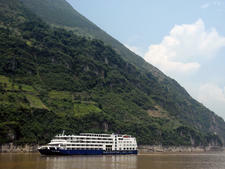 Launched in 2008 in China, Yangzi Explorer is a river vessel with five decks that can accommodate up to 124 passengers. 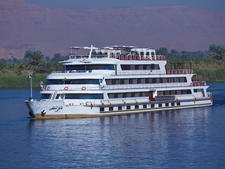 Launched in 1990 in Egypt, the Nile Adventurer river cruiser has five decks and can accommodate 64 passengers.